This was my situation on the morning of my pre-op appointment. My neighbors decided to park right where I have to back out! And on the other side, I was trapped by my landlord’s 3 cars! How was I supposed to get to the hospital?! No one appeared to be awake. 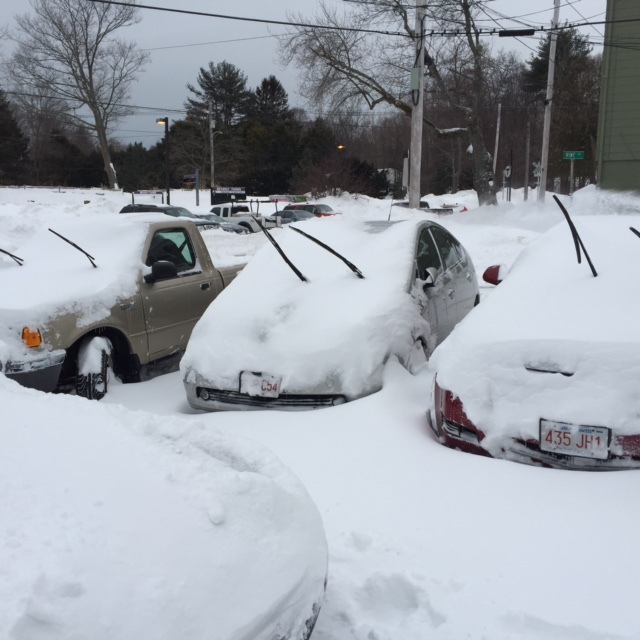 I shoveled out my car, called my landlord, and left a message, telling him I had to get to my appointment. Fortunately, he came out to help! He thought that if he pulled out, I could swing around and exit through his spot. 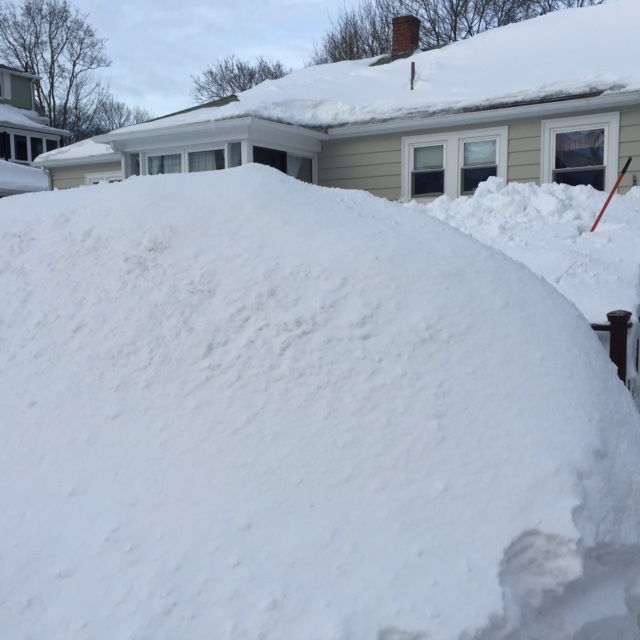 So, he started digging out his car, while I continued to dig out mine. Nearly an hour later, he was able to back out and drive around the block while I tried to get out. However, the turn was way too tight for me! I was afraid I was going to hit his wife’s car. I asked if he could do it for me, but he was afraid someone would hit his car if left in the road (now narrow enough to be a one-way street). He ended up going back inside to get his wife’s keys and back up her car in order to give me enough room. Fortunately, there was not much traffic on the road and I was able to get to my appointments on time! 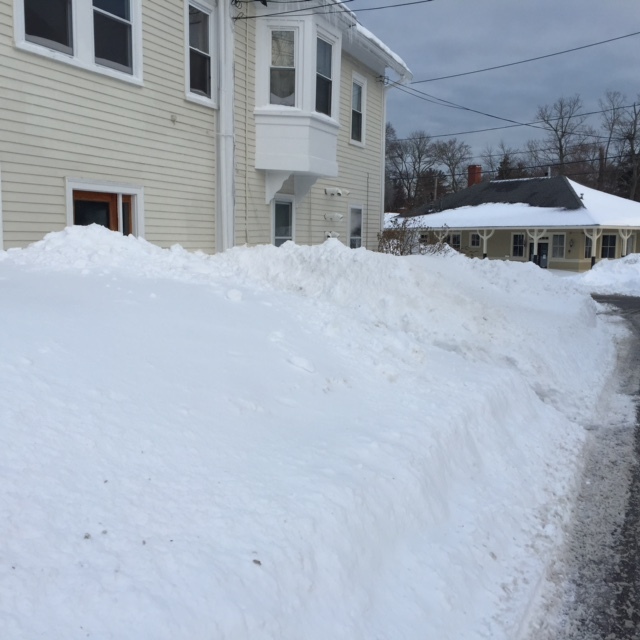 When I returned home after grocery shopping, I shoveled out a path to my front door that was wide enough to walk through with crutches. 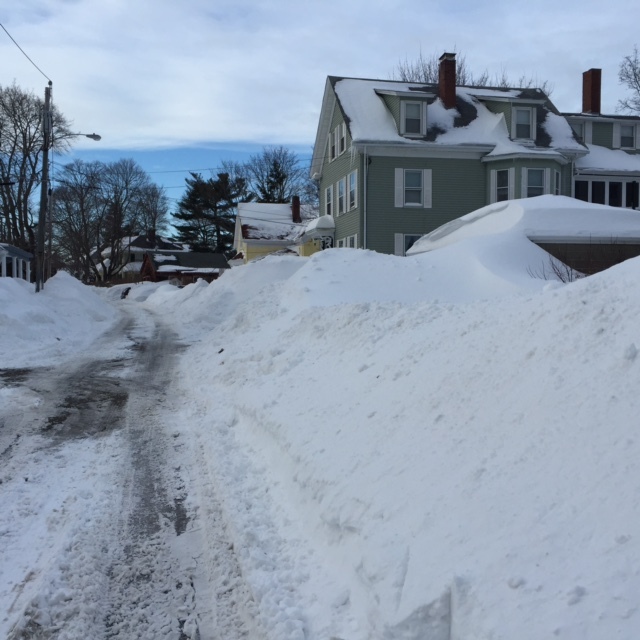 Here is what my street looked like. 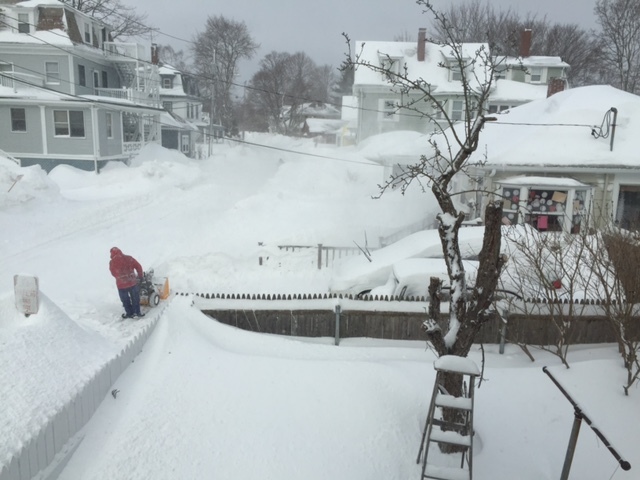 And then, several days after my surgery, another blizzard dumped 2 more feet of snow on the 7 feet we already had! 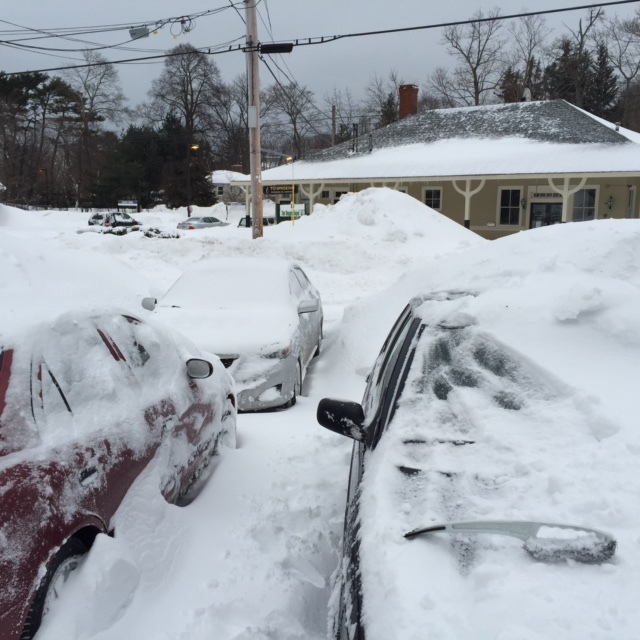 The “No Parking” sign is nearly buried! 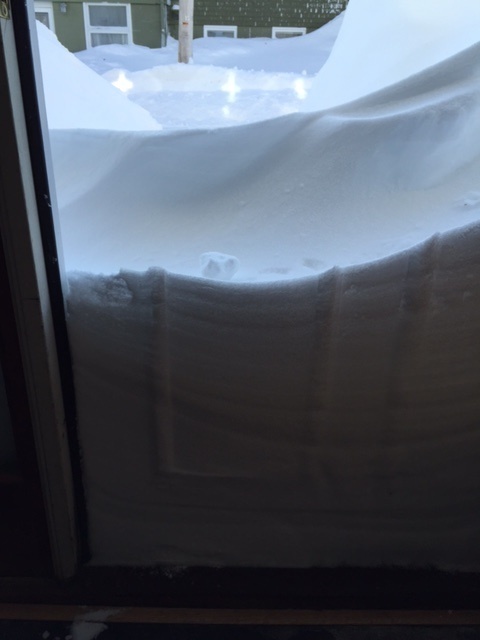 This is what my front door looked like when I opened it. I think my landlord thought I was bed-ridden and therefore didn’t need a path shoveled. So, four days after my surgery, I decided I was going to have to do it myself! It hurt my back more than anything because each shovelful had to be hurled over a gigantic mountain of snow! 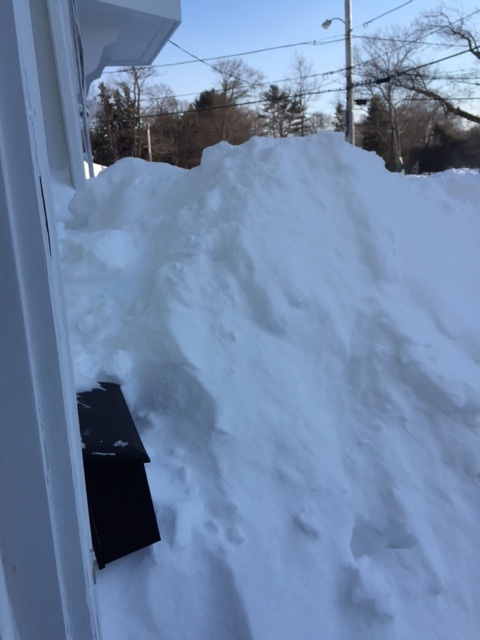 My friend Jacqui lives in a first floor apartment and can’t see out her windows because the snow is piled so high. “I’m getting claustrophobic!”. These days, she is fond of saying. “We’re all in the same boat” when describing how challenging life is. This time, she added, “We just need a bigger boat!”.